Sounds like a fabulous family time. I smiled at your resourcefulness. 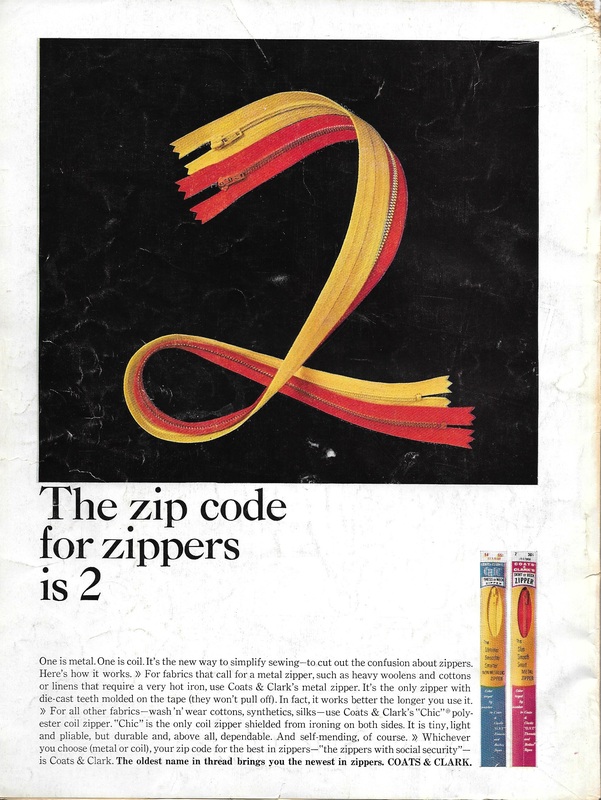 We have all had to “make it work” with materials at hand. And it is so helpful to have random sewing supplies on hand to help one’s resourcefulness! Another fabulous dress! I’m glad you had a great time out here in the West. Thank you, Heather! We are actually still here – just our family has departed. We are so enjoying the cool, cool nights and beautiful days. Glad you like the dress! 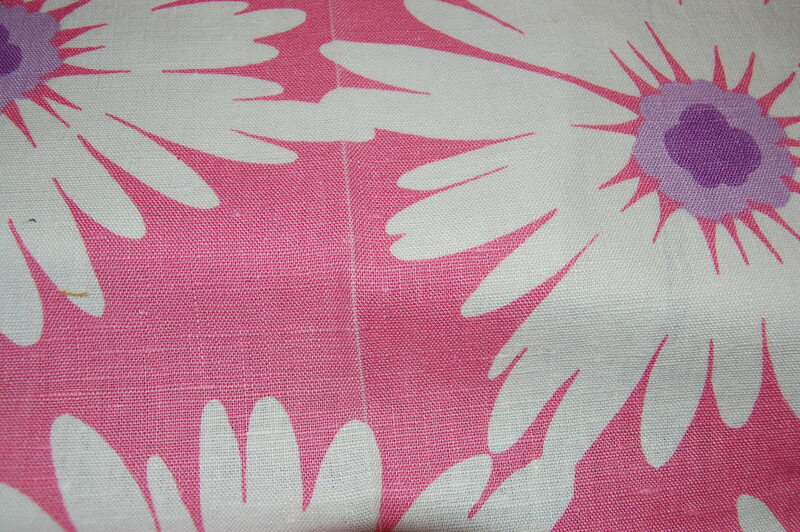 I love, love, love this fabric. The dress is another winner! Thanks, Peggy! 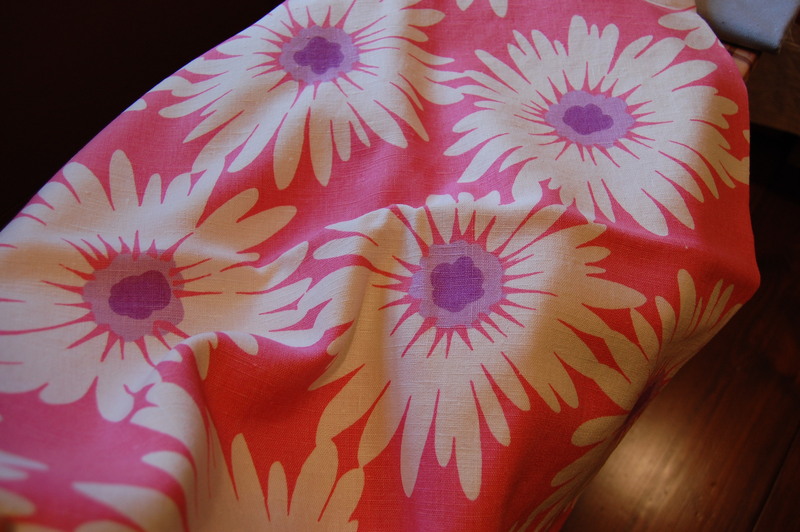 I, too, love this fabric – definitely flower power, but somehow looks very current, too. Wise words, indeed. And you put the attitude to work beautifully – the daisy dress is amazing! Thank you, Jen! I had to sew a few things by hand that I would have normally done on the machine, but it kind of made me feel kinship with our pioneers! What a beautiful dress. And I love the quotation too. Says it all. Thanks, Kate! I, too, love the quotation and suspect I’ll think of it often. Your vacation sounds like a piece of heaven and your dress is gorgeous. 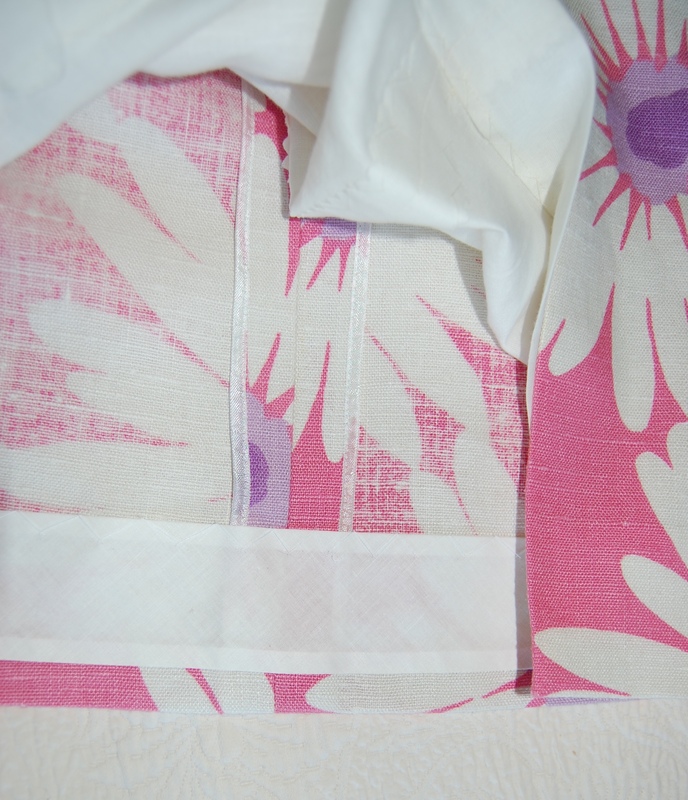 I enjoy reading the details of your sewing projects! Thank you, Jackie! Hope I’ll get a chance to wear the dress once or twice after we return home to Pennsylvania. Hey you did a fine job matching it up. Beautiful dress. Don’t you just love those hand me down price tags! It’s a real education to me to see the old old prices! And sorry about the goofy first comment I did. I was on the bus on my cell phone! Delete it all!! Always nice to hear from you, Linda! Thanks so much! Those foldlines can be such a nuisance! 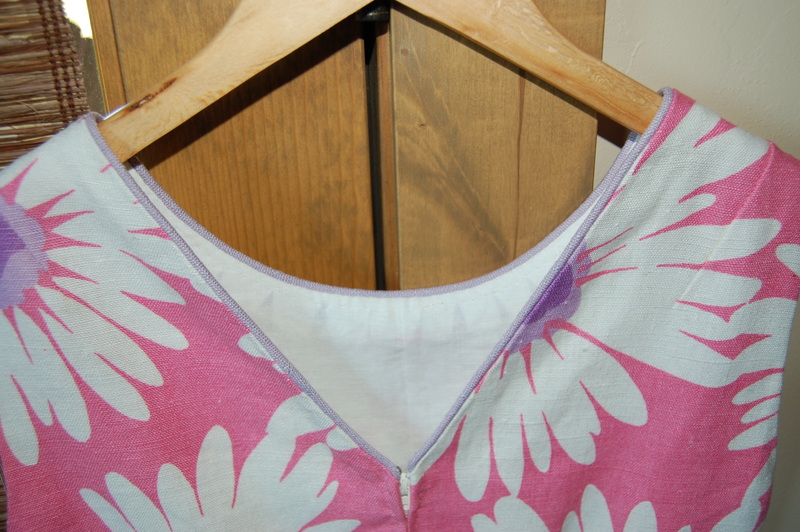 It’s quite an achievement to work around the faded line and still end up with beautiful pattern matching. 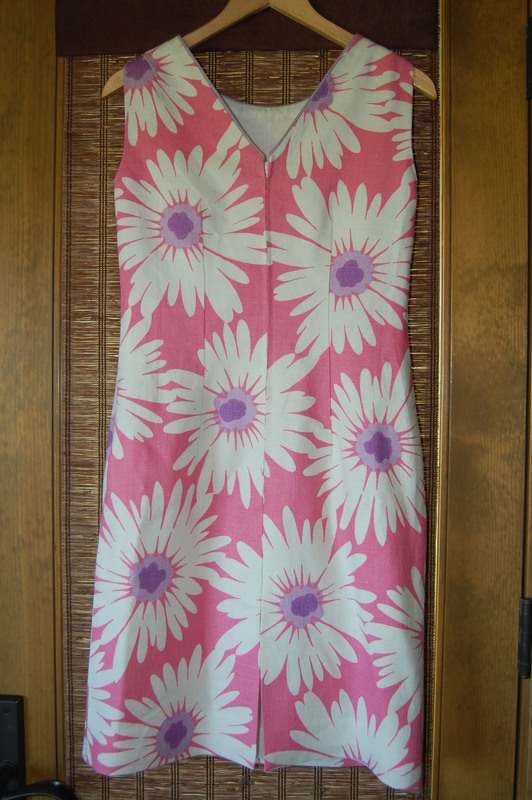 I love the sixties vibe of your dress! Thanks, Marianne! 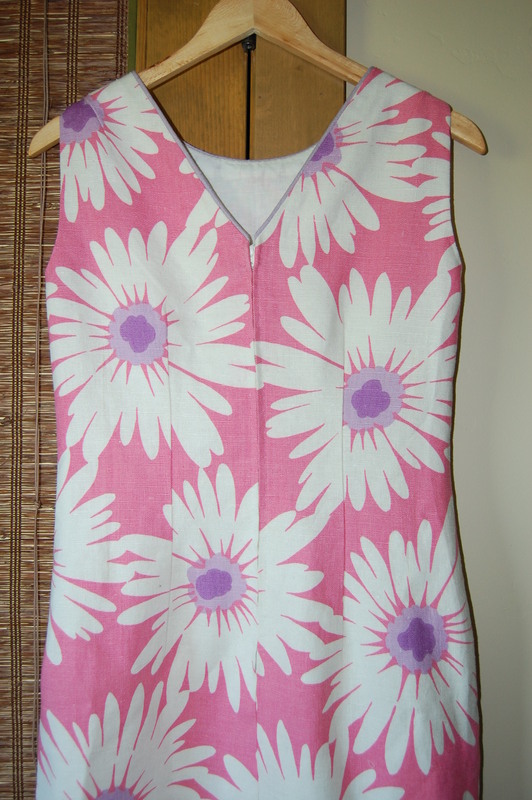 It’s so much fun to sew with ’60s’ fabric, even with the foldlines. Love that quote and where it’s written! Your dress turned out great. The piping really sets it off. 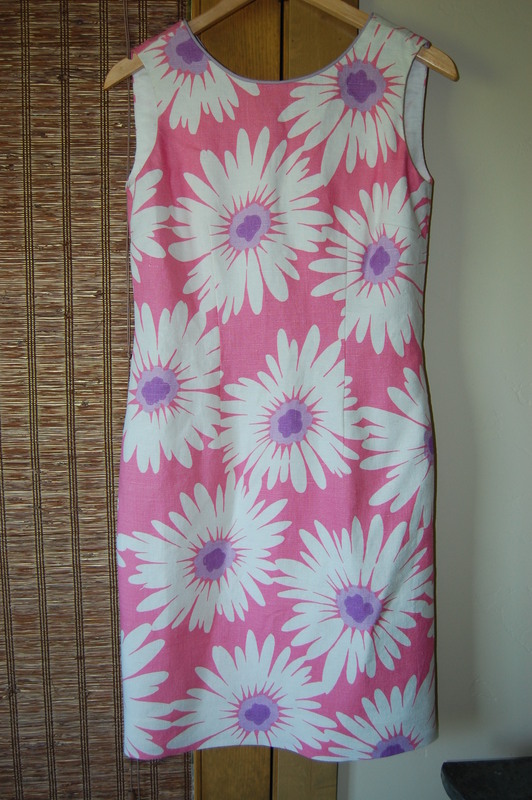 The print needed a sleek plain silhouette and adding the piping was just enough trim. Using the vintage sewing supplies was genius and so apropos to the quote! Thanks, Marguerite! 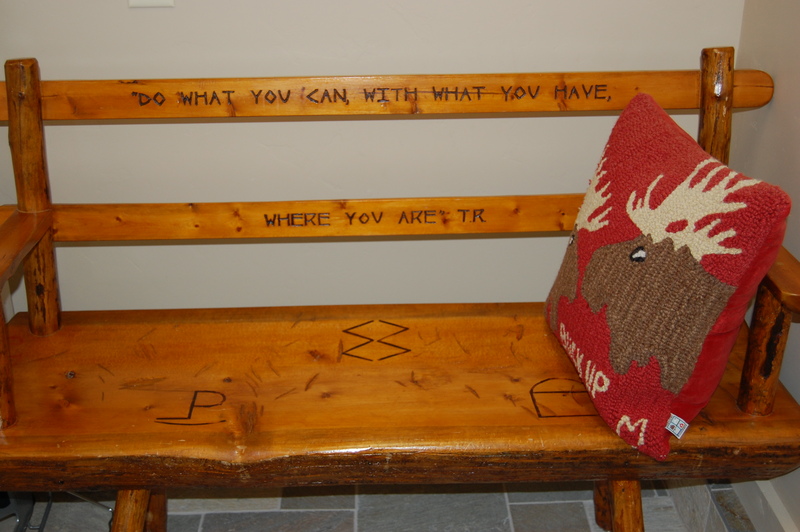 That bench was in the mudroom of the beautiful house we were renting for the month. Western style has its charms, even in benches! Glad you like the piping on the dress. I seem to keep on making sheath dresses, and mixing them up a bit with different details. One of these days I am going to say “Enough with the sheaths!” Sometimes, however, when fabric is scant, that’s the only kind of dress I CAN make!